Campitello di Fassa is one of the biggest resorts in Val di Fassa. It is a great ski holiday destination with a whole family thanks to new and modern facilities. Using fast modern cable car, you can be astonish by the beautiful view on Pian, other harsh peaks and their surroundings. If you are sports lover, this is the right place for you. Campitello is a great place to practise winter sports as well other activities. Campitello di Fassa is a medium sized ski resort in northern Italy. It was the first alpine and tourist resort in the Val di Fassa with hotels and other main facilities for use of alpinists and famous scientists. In the past the resort and it’s surrounding area was used as for pasture and work with wood. There are good train services from Italy and most surrounding countries to Bolzano. From there, you can take a transfer (shared or private) to Campitello di Fassa. Developing the price for your transfer to Campitello di Fassa we take in consideration several specifics of your trip. But you can count of Alps2Alps to get you there on-time and in-comfort, throughout the season. We do our best to keep all the transfer costs as low as possible. All of the above will only ever result in our base-rate for ski transfers going down – we never over-inflate our prices at any time or for any reason. We also offer substantial discounts for off-peak, off-season and midweek transfers to Campitello di Fassa. If looking for the best possible deals, travelling outside peak season or midweek typically results in the biggest savings. We offer midweek (Monday to Friday) prices with up to 60% discount than weekend prices. Your transfer quote will also depend on vehicle availability, transfer schedule, vehicle utilisation and other costs like road tolls and airport parking charges. 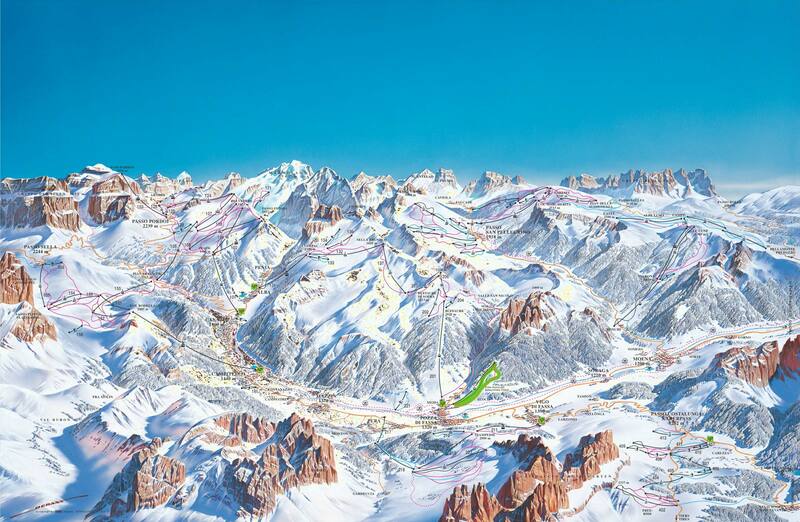 Campitello di Fassa is perfect ski destination for beginners and intermediate skiers. You will find here plenty of great ski slopes for your entertainment. Campitello di Fassa is a great ski destination for all the family, with kids in all ages. The resort offers several winter activities and entertainment in winter playgrounds. Each ski area offers snow playgrounds, nursery and easy slopes for children and beginners and many other facilities for all the family. To get the best possible deal for your transfer to Campitello di Fassa ski resort, book your service as soon as possible. If you are planning to travel to Campitello di Fassa during the peak of season, act fast because transfers fill up fast. If you can’t find the services you have been looking for, get in touch with us and we will do everything to help.